News Release – Las Vegas, NV, March 20 – The Nevada Indoor Agriculture Conference, which will bring together a diverse audience of thought leaders, industry professionals, entrepreneurs, farmers and investors to explore solutions and opportunities to increase indoor agriculture production in a sustainable manner has announced Paul Selina, Vice President of Applied Research for Village Farms, as the keynote speaker for the conference. Village Farms is one of the largest growers and marketers of hydroponic greenhouse production in North America. Paul was instrumental in developing the Greenhouse Advanced Technology Expert System (GATES) for the company. The GATES system was created to perfect year-round vegetable and fruit greenhouse production in high-sun and low-humidity areas. Paul has been a integral member of the GATES team from the first greenhouse in Marfa, TX, in 2006 to the new 30-acre facility in Monahans, TX. Paul brings a huge wealth of experience to the conference having spent his entire working life in the greenhouse industry, starting in England where he earned a degree in Agricultural Science from the University of Nottingham. 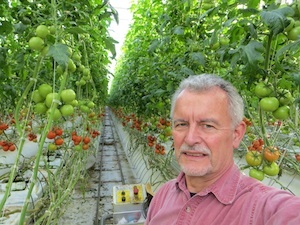 He has experience working in diverse climatic conditions and with a wide range of greenhouse technologies. Paul’s keynote will address, among other things, the importance of indoor agriculture to the future of farming, the opportunity that it presents to sustainably increase local food production in intemperate climates, and the key factors that will facilitate a vibrant future marketplace in Nevada and across the US. Register Now to Receive the Seed Saver Special Ticket Price and Hear Paul Selina’s Keynote Address!